This page displays detailed information about your server, and provides access to a variety of server management tools. The top portion of the page displays general information about the server, including connection status, operating system, version, hardware ID, and device ID, and alert policy information. Alert users This area allows you to determine who should receive notifications for alert events. Select the All administrators radio button to notify all the administrators on your team. Select the Select users radio button to notify specific users, including non-administrators. Type each name in the field and select it to add the recipient, or click the icon, select your recipients, then click the Done button. Alert media This area allows you to choose how you want to send notifications for alert events. Select the email radio button to only send a notification email. Select the email and text message radio button to use both methods of notification. Alert events This area notes that sync errors will generate an alert after 10 minutes. This setting cannot be adjusted. You may, however, adjust the time threshold for connection alert notifications. To adjust the number of minutes you want to elapse before connection event notifications are triggered, enter the number of minutes in the field provided. Use this setting for all Workplace"Workplace" describes the Autotask Workplace service in its entirety. 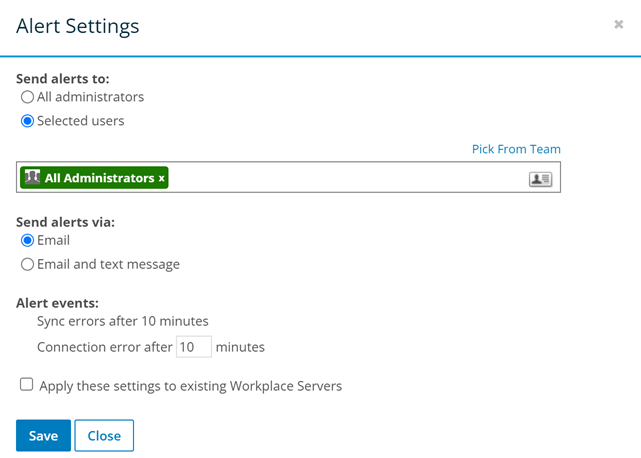 servers Select this check box to apply the settings you've just selected to all Workplace servers associated with your team. Workplace ServerWorkplace Server is a component of the Autotask Workplace service. It makes all your files accessible through Workplace while retaining local, centralized data storage so that your data is also available via your local area network (LAN). The Workplace service keeps all data on your LAN accessible internally and in sync with Workplace. 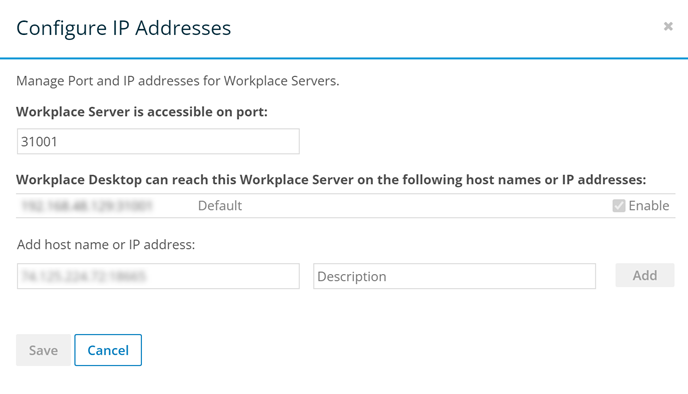 is accessible on port: Enter or update the port on which Workplace Server is accessible. Workplace DesktopAlso known as the Workplace Desktop app, and in the context of this documentation, simply "the app," Workplace Desktop is the software installed on a computer that is responsible for synchronizing data between the local drive and the cloud. can reach this Workplace Server on the following host names or IP addresses: This area lists all the host names and IP addresses at which Workplace Desktop can reach this Workplace server. To enable or disable the first host name or IP address, select or clear the Enable check box. You cannot disable this item if there are no secondary host names or IP addresses. To remove an item, click the X icon associated with it. You cannot delete the first host name or IP address. Add host name or IP address To add an item to the list described above, enter a host name or IP address, optionally enter a description, then click the Add button. Make sure that the ports you specify are open on your firewall. Click the More button at the top right of the page, then select Rename. Enter the new name in the resulting popup. Use this option to temporarily disable the device. Disabled devices still consume a license. Disabled Workplace servers cannot connect to the service until enabled again. Read the warning message in the Manage Workplace Server popup, then click the Disable button. To confirm your action, click the Disable button in the resulting popup. Files stored on a recycled server will be deleted in 90 days. Any necessary files may be restored during this period. Read the warning message in the Manage Workplace Server popup, then click the Recycle button. For security reasons, enter your password in the resulting popup.